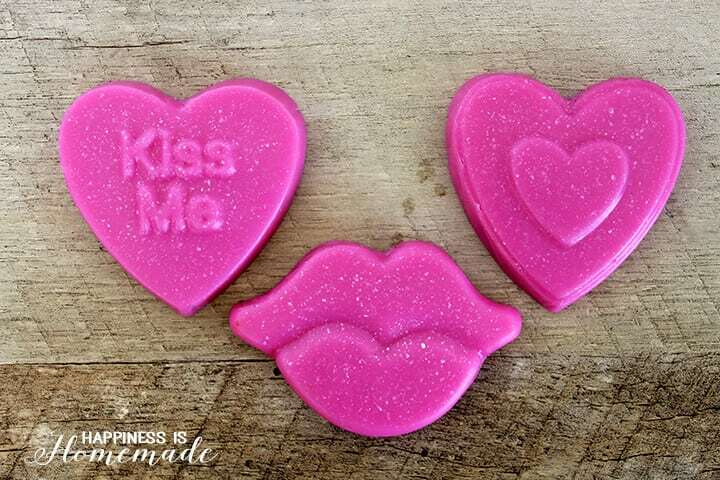 These quick & easy cranberry and pomegranate soaps smell irresistibly delicious! 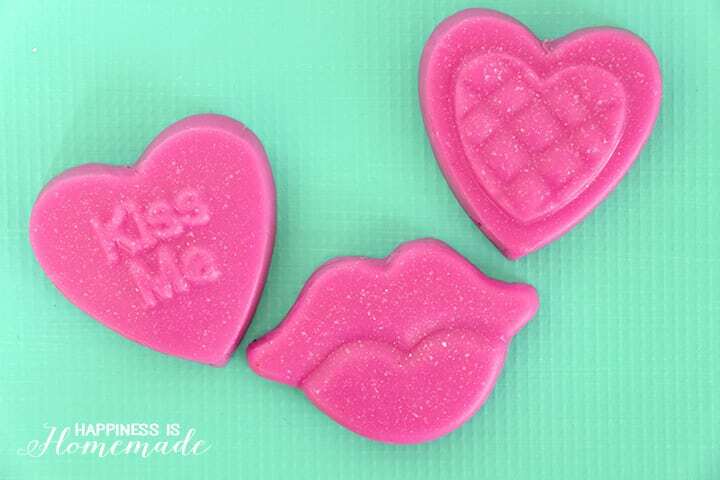 Use a cute holiday themed mold to make a fun DIY Valentine’s Day gift idea for your friends and loved ones! Note: If you’re using a metal mold/cookie pan, start by lightly greasing it with cooking spray or shortening – don’t skip this key step or else your soap will stay stuck inside of your mold forever! 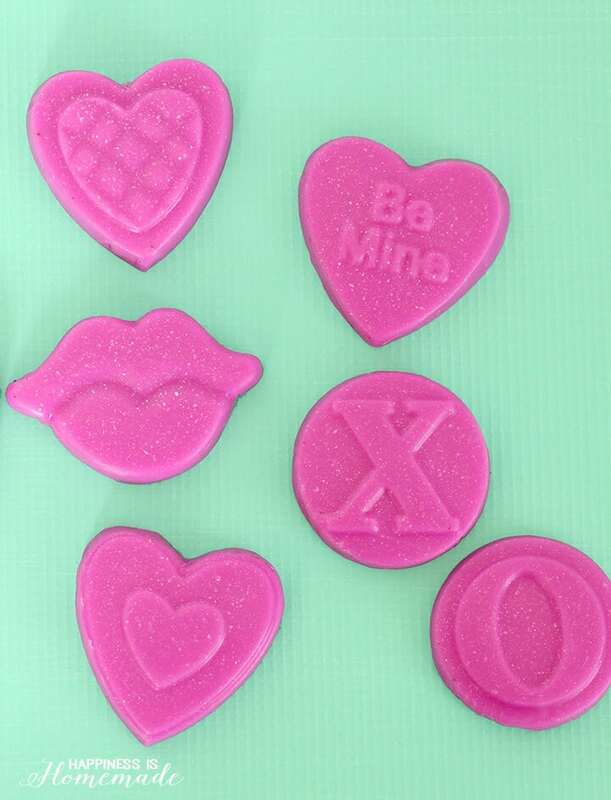 I generally prefer to use silicone molds for this very reason, but this cute metal cookie pan was just begging me to use it for a batch of Valentine’s Day themed soaps! I used about 1 lb (or half of the block) of soap base to make a dozen small soaps. 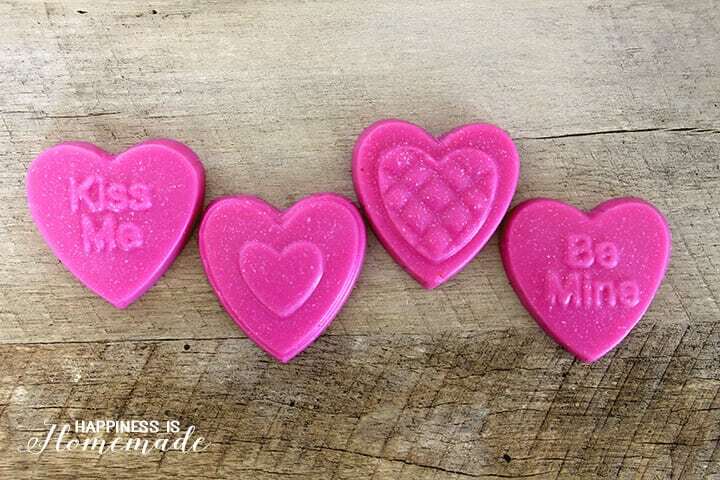 The block of goat’s milk soap base cuts easily with a kitchen knife, so I slice the soap base into cubes, place them inside a 4-cup Pyrex measuring cup, and melt it in the microwave in 20-30 second increments. Be sure to stir well after each microwave session to ensure that the soap is completely melted! For 1 lb of soap, I generally microwave for 30 seconds, stir, microwave for another 30 seconds, stir again, and microwave a final time for 20 seconds. 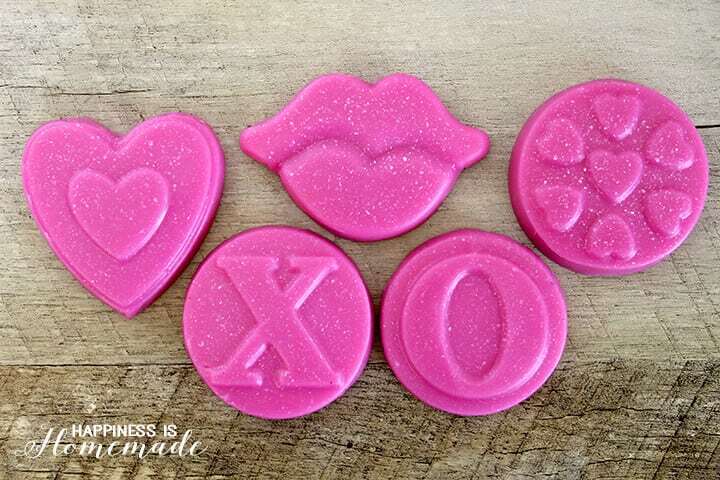 When the soap base is completely melted, stir in the wine colorant, 5 drops each of the cranberry and pomegranate fragrance oils, and a small amount of the crystal mica powder. Pour the mixture into the soap molds/cookie pan and allow to sit undisturbed until cool and firm (at least 30-60 minutes depending on temperature/humidity). Place a couple of the soaps into a cellophane bag, tie it with a ribbon, and they’re all ready for gifting! Easy peasy! Pomegranate is a good source of vitamin C and really good for skin and health. Making soap with it, sounds really interesting. I’m pretty sure the soap going to be really good. Definitely going to try! So sorry to hear that, Karen! It is definitely a lot harder to remove the soaps from a metal pan vs a silicone pan, but I have had luck with putting the pan in the freezer for a bit. That seems to help mine pop out when it’s been greased and it’s still hanging on! Best of luck!